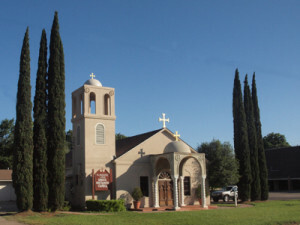 Saints Constantine & Helen Greek Orthodox Church is under Canonical jurisdiction of the Metropolis of Atlanta, the Greek Orthodox Archdiocese of America,and the Ecumenical Patriarchate. Our mission is to serve the religious needs of the Orthodox faithful, those born in the faith and converts; those of interfaith marriage; students and the unchurched. To minister to all Orthodox faithful regardless of ethnic or economic background. To accommodate everyone our services are primarily in English with use of Greek. The Church, as a living witness of Jesus Christ, has the desire that everyone embrace Him through the Holy Eucharist. We welcome all who are in need of spiritual growth and guidance and who seek to embrace God through the teachings of his Holy Church.